KANSAS CITY, Mo. 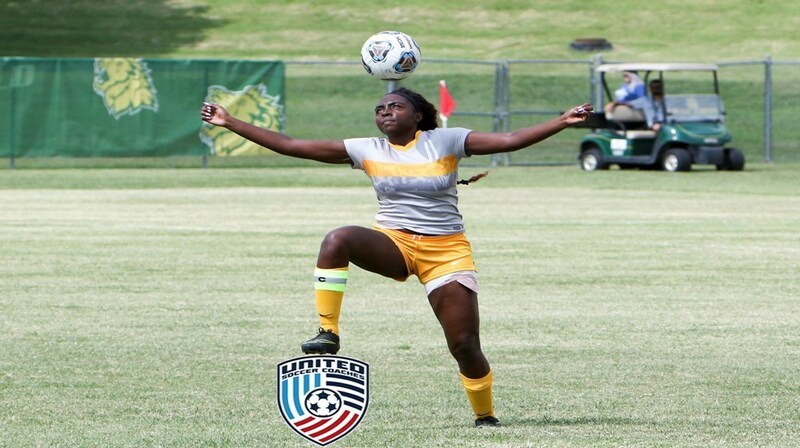 – Missouri Southern women’s soccer senior defender Ronise Miller was selected to the 2017 United Soccer Coaches NCAA Division II All-Central Region third team released over the weekend. Miller earned a spot on the All-MIAA second team as well after finishing the regular season as the only Lion to play and start in all 18 games and lead the squad in minutes played as well (1581). She only took one shot, but that did not matter as she assisted in preventing opponents from scoring in bunches, leading to MSSU finishing sixth in both goals allowed per game (1.164) and opponents scoring average (1.22). She assisted each goalkeeper to eight total shutouts, including three-straight shutout victories to close out the regular season with a 5-9-4 overall and 5-5-1 conference record. MSSU earned the fifth seed entering the MIAA tournament for the team’s first tourney berth since 2012. 12 other players from the MIAA were ultimately named to the All-Region squad, including five from NCAA champion Central Missouri (all 1st team), three each from Missouri Western (one 1st team & two 2nd team) and Northeastern State (two 2nd team and one 3rd team), and one from Fort Hays State (3rd team). K Ana Dilkes* Sr. University of Central Missouri Wichita, Kan.
D Kayla Hamner* Sr. University of Central Missouri Shawnee, Kan.
D Miranda Famestad Sr. Bemidji State University Sioux Falls, S.D. D Abby Nordeen Sr. Minnesota State University-Mankato Cherry Valley, Ill.
M Baylie Edwards* Sr. University of Central Missouri Lee’s Summit, Mo. M Madeline Cowell* Jr. Missouri Western State University Bridgeton, Mo. F Jada Scott* Jr. University of Central Missouri Bel Aire, Kan.
F Rachael Norton Jr. Bemidji State University Mounds View, Minn.
F Abby Rhodes* Sr. University of Central Missouri Olathe, Kan.
K Catherine Arneson Sr. Bemidji State University Fort Collins, Colo.
D Rebekah Thoresen Jr. Augustana University Minnetonka, Minn.
D Bridget Blessie* Sr. Missouri Western State University Papillion, Neb. D Jennifer Goethe Jr. Oklahoma Baptist University Shawnee, Okla.
M Bethany Sutherland Jr. Harding University Orange, Calif.
M Skye Finley Sr. University of Minnesota-Duluth Forest Lake, Minn.
M Dani Nelson Jr. Bemidji State University Woodbury, Minn.
F Cassidy Menke* Jr. Missouri Western State University O’Fallon, Mo. F Ruth King So. Oklahoma Baptist University Shawnee, Okla.
F Paulina Chavez* Fr. Northeastern State University Broken Arrow, Okla.
K Taylor Machacek Sr. Augustana University Sioux Falls, S.D. D Kelli Creese Sr. Minot State University La Verne, Calif.
D Sierra Phillips Jr. Harding University Warrensburg, Mo. M Hannah White Fr. Oklahoma Baptist University Norman, Okla.
M Melissa Giles* Sr. Northeastern State University Broken Arrow, Okla.
F Allyson Smith Fr. Bemidji State University Brainerd, Minn.
F Jenny Hoerter Sr. Minnesota State University-Mankato Stevens Point, Wis.
F Haley Berryman Jr. Minot State University Ephrata, Wash.